This book will engage you from the minute you open the cover... where you see a young girl gazing into a box labeled "Free Raptors". Who hasn't walked by a box of free (fill in the blank) and wanted to take one home? "If I had a raptor, I'd want to get her as a baby, when she's all teensy and tiny and funny and fluffy." The illustrations make you just want to go "awww-www" and look for something cuddly to scratch behind the ears. 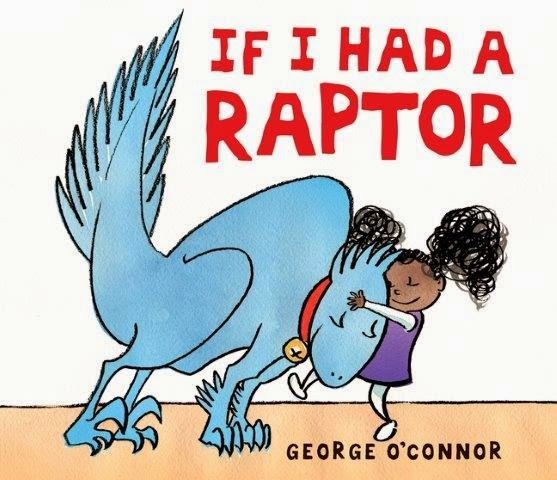 What I like about this book: As the girl explains what she'll do with her pet raptor, it grows larger and larger. We learn that raptors like to bask in the sun and snuggle in the clean laundry. They sleep all day long and can be picky about their food. They like to pounce on things, too. I also love the expressions George O'Connor gives the raptor - especially the "who me?" look some of us cat-owners know all too well. Beyond the book: Unfortunately, O'Connor doesn't get into the downside of pet ownership. The pooper-scoopers and clawed furniture.... Which leaves lots of room for imagination. Write a guide for how to raise your favorite dinosaur. In addition to the cute and cuddly things, add important info about the kind of kibble you need to feed it, how to brush its teeth, and best strategies for keeping it from leaping onto the table (or begging for food scraps during meals). Head over to Archimedes Notebook today to learn more about dinosaurs and find some other activities. 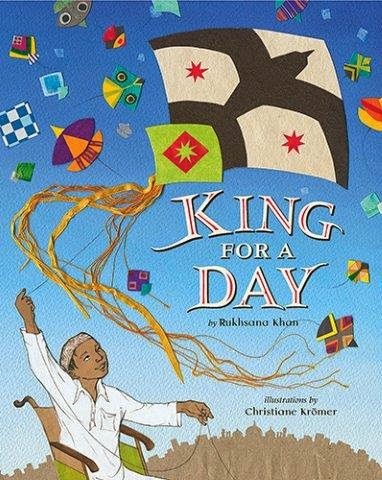 Today's review is also part of PPBF (perfect picture book Friday), an event in which bloggers share great picture books at Susanna Leonard Hill's site. She keeps an ever-growing list of Perfect Picture Books. Review copy provided by publisher. This week I'm digging into dinosaur books - here on Sally's Bookshelf and over on Archimedes Notebook where I'll highlight some great nonfiction dino books. Come back Friday for another book and some stuff to do. It's a perfectly normal day in the classroom. Apatosaurus is busy coloring, Pteranodon's busy with scissors and paper, and Velociraptor's sprinkling glitter everywhere. But not Tyrannosaurus - he can't seem to do anything right. 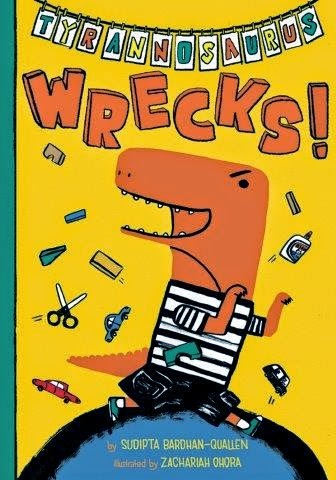 No matter whether they're writing at the board, reading books in the quiet corner, or building towers with blocks.... Tyrannosaurus WRECKS it all! What I love about this book - besides its wonderful rhyme and wacky imagination - is that Sudipta B-Q gives each little dinosaur its full multisyllabic name. And kids LOVE to say those names: Iguanodon, Stygimoloch, Styrachosaurus. For parents (and anyone else) who needs extra help, there's a handy-dandy illustrated pronunciation guide on the endpapers. If you want to know what it would be like to be a young dinosaur, head over to Archimedes Notebook for a review of If You Were Raised By a Dinosaur. See you Friday for more dino-antics. "Basant is the most exciting day of the year!" It's a holiday filled with feasts and music and parties celebrating the arrival of spring. And many of those people will climb to the rooftops of Lahore [Pakistan] to participate in kite-flying battles. This is the day Malik will fly his kite, Falcon. He will send Falcon into the sky to battle with the kite of the bully next door - the bully who throws stones at his sister and calls names. The bully's kite is huge, but Malik is sure his small, swift Falcon can win the day. What I like about this book: The artwork is amazing - collages that incorporate lace and fabric and papers. The illustrations draw upon the folk art designs of Pakistan - and the kites are so bright I just want to make one myself. I like the kite battles, and the peek into a traditional celebration that embraces sky and skill. Beyond the book: It's never too late to make a kite. The bold illustrations may inspire some kite designs - or if not, check out these photos of kites kids made for Basant. You'll find a video of the kite festival here (it's rather long-ish - 8 minutes). Turn a shopping bag into a kite - just follow these step-by-step directions. Then head out to a park or field and go fly a kite! All you need is a nice day and a bit of a breeze. "One sunny say, a penguin and a rabbit fell in love." So begins this cute tale of a young chick - no... the first thing to emerge from the egg is a long ear. Followed by another long ear and a fuzzy little body, two penguin feet, and a fluff of a tail. 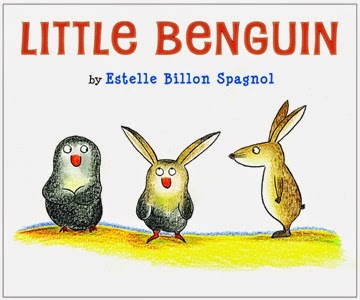 Little Benguin is, to put it bluntly, unusual. So unusual that other kids are afraid to play with him. Sometimes Little Benguin loves being his own unique self. Other times he doesn't like being different and wants to be "normal" - a desire some parents hear a lot from their kids who just happen to be a bit different. Then one day a big bad wolf arrives - and Little Benguin uses his diverse talents to escape - and, in the process, just happens to save all the other kids from becoming wolf snacks. Some reviewers have leveled harsh criticisms at this book for it's "dated plant and animal breeding stereotypes" and underlying message that those who are different have to prove their worth to those who are "normal". Me? I think this book is just plain fun. For one thing - a bunny that hatches from a penguin egg might explain a lot to kids who still wonder why Easter bunnies deliver eggs and peeps - something I have yet to figure out. Besides, where do those folks think gryphons come from? Review copy provided by publisher. "It all started quietly, like a conversation with Joe DiMaggio himself," begins Barb Rosenstock. "One shy single, hit to left field, smack in the middle of May, the fifteenth." The Yankees lost that game. It wasn't news- the headlines were overtaken by stories of the war spreading through Europe. Still, that one hit was the start of something big. Because Joe kept hitting, and hitting... and by the time he'd hit runs in 20 straight games people started talking about a streak. Joe hit fastballs, knuckleballs, screwballs and curves. As long as he had his faithful bat, Betsy Ann, he hit anything pitchers could throw at him. He and Betsy Ann tied the record, hitting 41 straight games. Could anyone stop him? Then, as another game started, Joe reached for his bat. Betsy Ann was gone! Could Joe keep his hitting streak going without Betsy Ann? 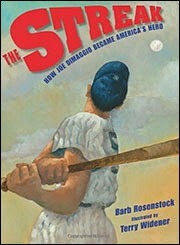 Rosenstock keeps the tension going as she unfolds the story of America's baseball hero. She adds context and history with an author's note and provides a page of statistics, plus lots of resources for the baseball enthusiast. A perfect read for a mid-May day. Review copy provided by publisher. There are so many excellent nonfiction books this year - and this is just one of 'em. In 1950, fifteen-year-old Barbara Rose Johns was a high school junior with a problem to solve. She and her sister and all her friends attended the high school for black students located in the next town. The school was a too-small brick building with temporary classrooms built on to accommodate the large number of students. Those "temporary" classrooms were, writes Teri Kanefield, "made of wood covered with a heavy paper coated with tar." The kids referred to them as "chicken coops". The problem, as Barbara Rose Johns saw it: they weren't temporary. The roofs leaked. They had no heat except for tiny wood stoves - and students had to wear hats and scarves to class. When Barbara told her teacher that she was "sick and tired" of the second-class school, her teacher challenged her to do something about it. But what could a kid do? Barbara led her classmates in a strike - a peaceful boycott meant to draw attention to the appalling conditions at the school. 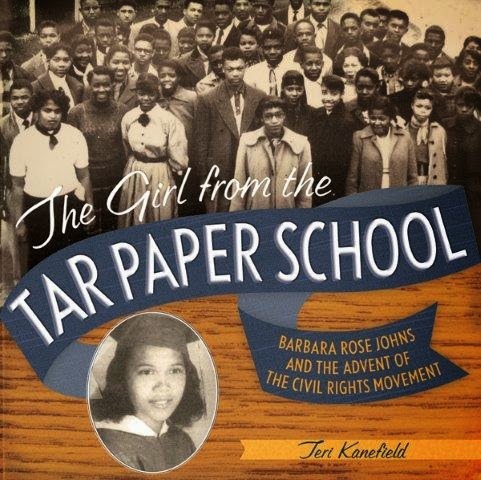 There is a wonderful chapter in the book that details the strike, and subsequent chapters that tell about the Civil Rights movement that came on the heels of Barbara's boycott and Brown v Board of Education. The book is rich with photos and back matter that includes authors note and a Civil Rights timeline. Check out what other bloggers are reviewing over at Nonfiction Monday. Review copy provided by publisher. "Ike wanted to write a story. An incredible story..."
But there's a tiny problem. Ike doesn't know what he wants to write about. Anyone who writes will identify with Ike. Before he can settle down to write he needs to find his favorite pen, talk with a friend, clean the house.... (sound familiar?). Or maybe he needs some ink. Some special ink that is for this particular story. Why I like this book: I like Ike. I like that he's a procrastinator - but an adventuresome procrastinator. I particularly love the scene in his lab, when he mashes and bludgeons and crushes and steams all the necessary ingredients - especially as there are days when I want to mash and bludgeon and crush my pencil because it holds my words hostage. And I really love Ike's inksplot body - who knew inksplots could be so expressive? 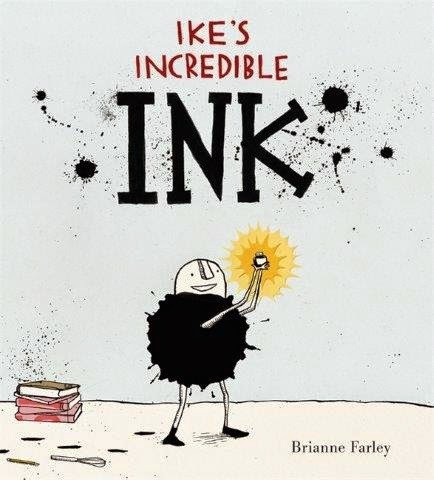 Beyond the Book: Why not mash, smoosh, bludgeon and crush your own ink? Soldiers in the Civil War made ink to write their letters home. They used things they could find: blueberries, blackberries, strawberries, raspberries. Make Blueberry Ink. You need 1/2 to 1 cup of blueberries, a wooden spoon to smoosh them with, a strainer in which to do the smooshing, and a bowl to catch the juice. Mash the berries into the side and bottom of the strainer to release the juice. Then leave the strainer over the bowl for a while so the juice runs out. Now stir 1/2 teaspoon of salt and 1/2 teaspoon of vinegar into the berry juice. The salt helps the ink set. If your ink is too thick, add a bit of water. Store in a closed container. Make some Inkblot Art. You can make something as simple as a splot, splat or splish. Or you can capture a splidge of ink in the fold of a paper and create some fantastic designs. For excellent inkblot projects, check out the Inkblot Book blog. Today's review is part of PPBF (perfect picture book Friday), an event in which bloggers share great picture books at Susanna Leonard Hill's site. She keeps an ever-growing list of Perfect Picture Books. Review copy provided by publishers. An art teacher I know once asked kindergarteners, "How many of you are artists?" Nearly everyone raised their hand. When she asked third- and fourth-graders this same question, less than half the class raised their hands. In the sixth-grade classes only one or two kids raised their hands. "Ask a room of adults," she says, "and chances are no one will raise a hand." Somehow we forget how to be artists. Or we begin to be too critical about what we put on paper. 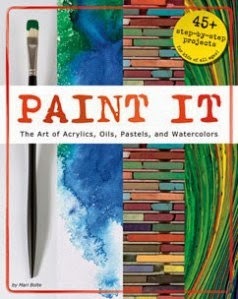 In a single volume, Capstone Press brings together four of their books in the "Paint It" series. It's nice to have them all under one cover... because some days you might want to play with watercolors and another day might beg for something more textured. Don't know how to paint? Don't worry. Each chapter opens with a section titled "In your Art Box". There's good information about paints and pastels, brushes, papers, and notes on "color palette"- what you might want to stock up on for the first few projects. Then there are the projects - more than 45 in the book - each highlighting a different technique to explore. Projects range from "testing the waters" to mixed media, Chinese brush painting to glazes and scumbles. Paint large, paint small... try some realism and some abstract. Use lines, use dots. Toss in a sponge or layer it on with a spatula. The big picture: step out of your comfort zone and get paint on your sleeve. Or nose. Tip: if you're painting in the kitchen, buy a large plastic table cloth to put on the floor so you don't leave paint splots on the linoleum. Head over to Nonfiction Monday to see what other bloggers are reviewing. As for me - I'm off to rummage through the art closet and see whether we've got any paints left... Review copy provided by publisher. And so you go to where the sign says Please Line Up in Single File and you are the very last one in a long, long line. You know it’s the best attraction because you are number 50, right behind the lizard and a mouse. Somewhere up ahead you can smell … yup, skunk’s up there. And farther up, is that the hungry roar of a lion? Finally it’s time to board the Jumbo Coaster! It’s so big that the pages open, like a gate, so you can see everyone get on board. Then you’re off on the ride of your life, flipping and diving and… I don’t want to give away the surprise at the end. But I will say that the anticipation is at least as much a part of the story as the ride itself. And the riders – well, each has its own quirky personality. 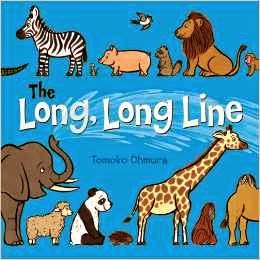 There are lots of Things to Explore in this book: numbers, animals, how they’re lined up, how they relate to each other, a fun word game and some potential danger when the carnivores get hungry.